Northwest Star (Soc) Ltd (NWS) is a subsidiary of Northwest Transport Investments (Soc) Ltd (NTI) which is a parastatal company of the North West Provincial Government. The North West Provincial Government is the sole shareholder of NTI. 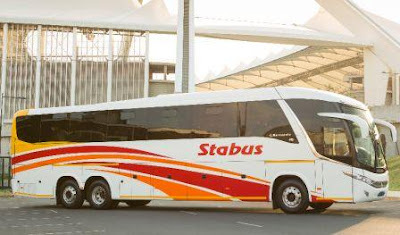 Northwest Star (Soc) Ltd (NWS) was the primary source of transport in the North West Province since its inception, providing transport service also in Limpopo, Mpumalanga and Gauteng Provinces to thousands of commuters (monthly) with a fleet of 640 buses. 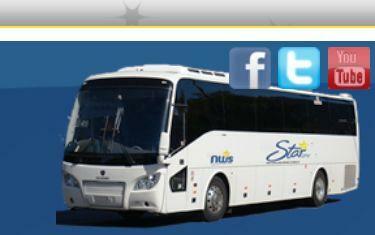 Northwest Star (Soc) Ltd is widely regarded as one of the premier transport operators on the African continent. The operations of the company started in 1973 under the then BIC and CED and the company was established in 1986 and has had several name changes. With the promulgation of new Provinces after the 1994 elections, the company’s name changed to Northwest Star (Soc) Ltd. These centres are ideally located to serve their passengers to their best interest and for easy access to communicate transport needs and requirements on an ongoing basis. of our passenger’s changing transport requirements and new transport demands. Northwest Star (Soc) Ltd provides a network of public transport services to commuters, linking the North West Province and Mpumalanga to the City of Tshwane, Ekurhuleni and Midrand. Mainly these services are operated in terms of a contract with the department of transport in which a substantial portion of their passenger’s fare is being subsidized by government. Apart from providing transport services to their working passengers and school children, off peak services are also provided to shoppers, and transport destinations that include services to hospitals, clinics, pensioner pay points etc. Private Hire (Touring and Social) transport services are also provided to organised groups in our community to any required destination. Such services in the past include destinations such as Polokwane, Lesotho, Swaziland, Mozambique and many others. To make use of these services you are welcome to contact any of our Operating centres for a quotation. 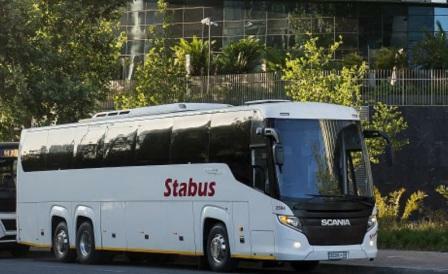 The passenger transport services operated by Northwest Star (Soc) Ltd are currently performed in accordance with interim transport contracts with the Gauteng Department of Transport. 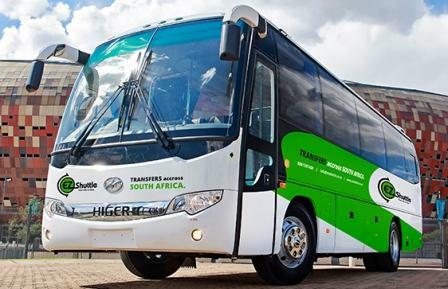 The passenger transport services operated by Atteridgeville Bus Service (Soc) Ltd are currently performed in accordance with a tendered contract service with Gautrans. Atteridgeville Bus Service Is a Pretoria based bus company which was established in October 1988 when the National Department of Transport has implemented the first tender for contract services pilot project which was awarded to Transport Resources Management (Soc) Ltd trading as Atteridgeville Bus Service. Transport Resource Management was at that stage a subsidiary of Bophuthatswana Transport Holdings (Soc) Ltd which name changed later to North West Star. 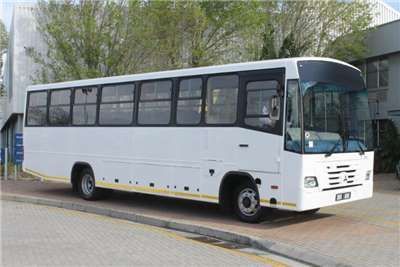 The company’s name was changed to Atteridgeville Bus Service (Soc) Ltd during May 1994 when the tender for contract to provide public passenger transport services to the residents of Atteridgeville/Saulsville Suburb was again awarded through the National Governments tender process to the NTI Group of Companies. 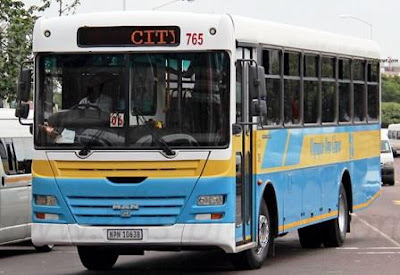 In April 1996 the tender for contracts to provide passenger transport services between Atteridgeville and surrounding areas in the Greater Pretoria Metropolitan Council (City of Tshwane) was again awarded to Atteridgeville Bus Service for a five year period ending February 2001. Since then the ABS contracts were operated on a month to month basis for the Gauteng Department of Roads and Transport due to no new tenders were published and adjudicated. Contract D28: Provision of PassengerTransport Services between Atteridgeville/Saulsville and Pretoria CBD. Contract D29: Provision of Passengers Transport Services between Atteridgeville/Saulsville and Western and North Western Areas of the Greater Pretoria. Contract D30: Provision of PassengersTransport Services between Atterdigeville/Saulsville and Centurion, Midrand and Menlyn. Currently ABS operates 123 buses, transporting cumulatively 4,2 million passengers over 5,1 million kilometers per annum and employs 241 employees. The Pretoria West facility of North West Star (Soc) Ltd host all the management and operations of ABS inclusive of vehicle maintenance, bus washing, vehicle inspection, fuelling, scheduling, despatching, ticket and fare collection, administration, financial and other related activities. The areas and routes that ABS covers in their contractual agreement can be divided into three different areas covering routes on a predetermined time table prescribed by the Gauteng Department of Transport. Contract D28: Provision of PassengerTransport Services between Atteridgeville/Saulsville and Pretoria CBD (Callies and Callies Terminus). and surrounding areas) of the Greater Pretoria Area (City of Tshwane). 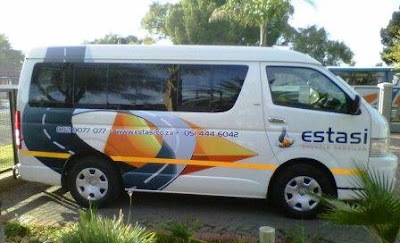 Estasi Shuttle Services Is a South African transport company which situated in Bloemfontein and they deliver transport from (and to) Bloemfontein to Pretoria, making stops in Winburg, Ventersburg, Kroonstad, Kroonvaal Toll Plaza, Johannesburg (Joburg), Midrand and Centurion. Most of their fleet are Toyota Hiace and Quantum which have a maximum carriage of 11 seaters. Their buses are fitted with air conditioning units and are maintained in good order. Make use of the FREE Wi-Fi services onboard the bus, to check your e-mail and browse internet. Their goal is to offer our customers reliable and comfortable transport, with the added benefits of on board WiFi, power points and on board entertainment. They Great deals and tarrifs on all routes! Take a look at our Pricing and Routes for more. Their vehicle can be delivered anywhere in South Africa. 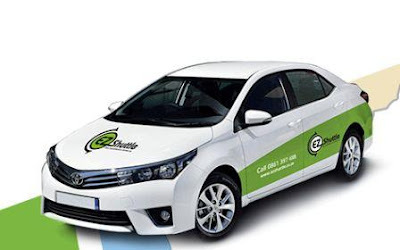 In addition to their shuttle services, They also offer their clients a unique service in delivering their vehicles quick and effortlessly anywhere in South Africa and neighboring countries. If you are interested in their Bus Hire or Transfer Service, please fill out the following FORM and they will contact you as soon as possible with a quotation. Lowveld Link Travel Is Mpumalanga based transport company which was launched in September 1992. 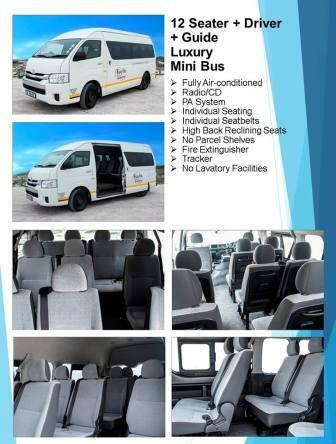 The company mainly focus on shuttles services and internal tours within South Africa. Lowveld Link Travel is located in White River, Mpumalanga, with the Kruger Mpumalanga International Airport and the world famous Kruger National Park right on our doorstep. Lowveld Link Travel conform to all legal requirements of the RSA in that they are qualified with the Road Transport Board, and that each driver has valid professional drivers permit. Their passenger liability covers up to R30 million per vehicle. Lowveld Link Travel own a very luxury minibuses and saloon care to conduct their daily passenger transportation services. 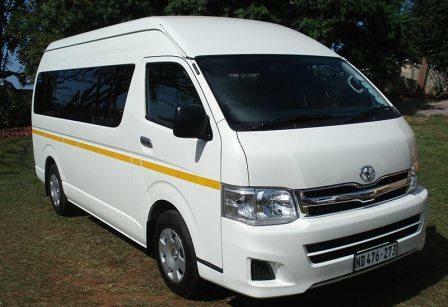 Most of their minibuses are Toyota Quantum and their Saloon Car are also from Toyota Manufacture like Prado and other models. 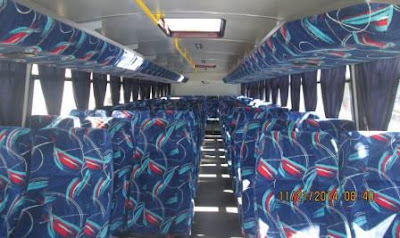 All their buses are fitted with aircon, radio/tape/CD players and with very comfortable, clean cloth Seats. 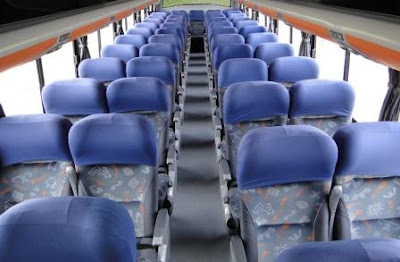 Seating configuration is 22 Passengers and one driver. Larger coaches at competitive rates can be arranged on request. Their drivers are neat, professional, experienced and extremely competent. Lowveld Link Travel has trailers and can be supplied on request at a nominal fee. Quotes for hire/sub hire/transfers are provided on request and tailored to suit your requirements. 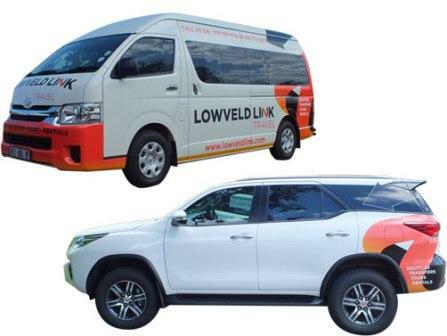 Lowveld Link Travel has got 22 seat buses and 14 seat Toyota Quantum’s available for transfers and hire. Quotes for transfers and hire are provided on request and tailored to suit your requirements. 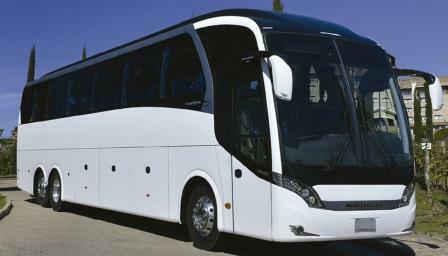 Larger coaches at competitive rates can be arranged on request. Enjoy a relaxing journey with friendly, capable drivers. Their vehicles are comfortable, air conditioned and well maintained. They will, for sure, take the hassle out of getting to and from Kruger Mpumalanga International Airport. Pre book your trip today and enjoy a personalized welcome by our drivers holding a KMIA Airport Shuttle signboard. Lowveld Link’s Chauffeur Service will collect yo, take you wherever you want to go and wait for you!. The perfect solution to hassle free travel. JSL Shuttles & Tours Is a transport company which provide reliable and safe shuttle services throughout the Republic of South Africa & neighboring countries. JSL Shuttle & Tours is the perfect option for hassle free travel when you want to visit loved ones, travelling for business or reaching your holiday destinations. They can pick up your group with a tour bus from O.R. Tambo or Kruger Mpumalanga International Airport to your choice of accommodation in Marloth Park, Komatipoort, Malelane or Nelspruit. 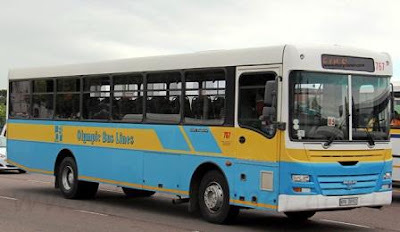 Olympic Bus Lines Is a Kwazulu Natal based bus company which provide daily transport services to the people located in the regions and other cities and towns within South Africa. Olympic Bus Lines Is popular for travelling between Pinetown and Durban and Marianhill and Durban. This company has owned 736 buses since they began a bus service. The Company doesn't provided enough information for listing but we are trying hard to contact the management and we will update all the needed information. 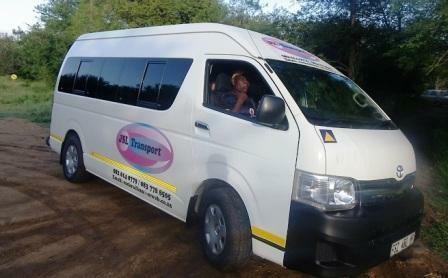 Thari Bus Service Mothotlung is one of the popular Charter Bus Service located in Moumong South Africa. Thari Bus Service is a subsidised commuter transport operator which contracted by the department of community safety and transport management in South Africa to ensure that communities were transported in safe and reliable transport to access work stations and other related areas of services. 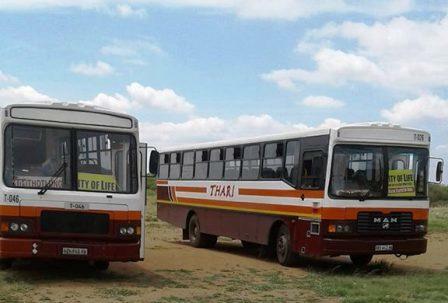 Thari Bus Service offers transport service to commuters in the Bojanala District, They transports people from Lethabong to Rustenburg, They also transports people from various areas around Brits. Botra Bus Service Is a Passenger transport charter which have Headquarter at Stockenstrom St, East End, Bloemfontein, in South Africa. It is one among the most popular bus company in the region which serves their passengers on daily basis. Though they have started their services with Local assembled Scania and Benz bus models, They are now expanded their fleet with modern coaches like Scania Marcopolo, Benz and many more. They have achieved growth by keeping their fleet in good maintained condition. They have a trained staff for their specific tasks and consultations with their customers on a regular basis. Ensure competitive fares and informed decision making by the mangers and diretors of the company. Lowveld Bus Service was founded in October 1983 by Louis Rossel and Garnet van der Walt. The dormant company name Laeveld Bus Diens was bought by Thaba Nchu Transport as well as 20 permits to operate a passenger service in the Ellisras area. The first buses were bought from SA Transport in Kimberly and brought to Ellisras. A very small depot was established on a plot on the outskirts of town which consisted of two rondawels and no proper workshop. In 1989 a better equipped depot was built in Onverwacht, Ellisras to accommodate the growth and to sustain a reliable and safe service. In 1990 Lowveld Bus service was awarded a contract by the then Iscor mine to convey passengers to the Grootegeluk Coal Mine and back. The demand for transport also grew over the years as the town started expanding. In 1998 the Department of Roads and Transport put out a kilometre based tender for transport in the area and it was awarded to Lowveld Bus Service. In 2001 one of the owners Garnet Van der Walt was bought out and a new company Buthotis Trading (Pty)Ltd t/a Lowveld Bus Service. They cover the whole Lephalale area including the rural areas surrounding Lephalale (Seleka, Melkbosch, Abbotspoort, Shongoane and Marapong). 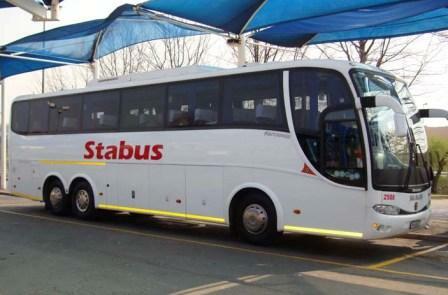 They also have a daily service to Pretoria and back. They do contracted services to The Grootegeluk Mine, Matimba Power Station and the new Medupi Power Station. Their private hire services cover the whole of South Africa and some areas in Botswana. Being the capital city of South Africa, Pretoria is one of the well organized cities within the most developed country in Africa. Getting from point center to another throughout the city is easy due to the well established road network, the number of signs in English and Public Transport system has maintained to the satisfactory level. This station was established in 1910 and it was first Southern African State Building designed by Sir Herbert Bake. Since then, the Station is undergoing some maintenance to keep it fresh and modern compared to the time being and technology. 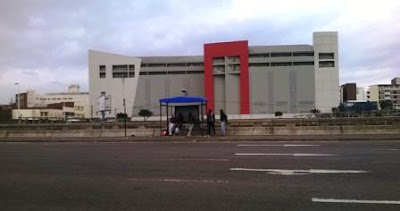 The Pretoria bus station is next to Pretoria’s train station. You will also find the major companies’ booking and information offices here as well as a good cafe and an ATM. 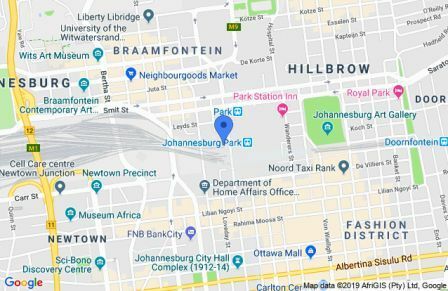 Pretoria Central location is at the following address: Office 4, Pretoria Station, 180 Scheiding St Pretoria Central, Pretoria 0002, South Africa. It is Nearby to Pretoria's Burger Park and various Museums and by taxi to Melrose House or Kruger House or famous Church Square. This station has done some revamps including restaurants like Mcdonald's, Debonaires,etc. Now this place looks better that it was before. There is a Limited short term motor car parking available at the station though most of the time it is full and no spaces available. The station is in a crowded and run down part of town although the station building is in good condition. 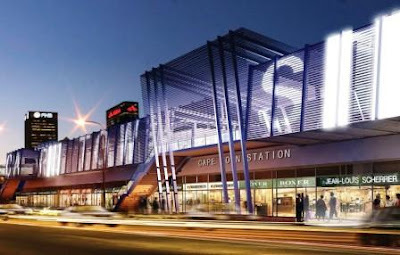 The Station Is a center point for all passenger rail service North south east & west and is next doors to modern HIGH speed GAUTRAIN station with its more than adequate secure parking. There is a gardens in front the station a relic of more genteel days and because of the now rough area Tourists should be careful here. Worth a visit for its architecture and historic roots and from here other sites in close proximity. Taking the Gautrain to the station in a pleasure but driving there is challenging when looking for parking. It is very crowded during peak commuting hours and when we were there a group of people were harassed in the parking area. In general it was clean and well kept. Set in Pretoria, 3.9 km from Union Buildings, The Park Lodge Hotel features a garden. Muckleneuk Manor is set in Pretoria, 3.7 km from Union Buildings, and features an outdoor swimming pool and a garden. Boasting a 24-hour front desk, this property also provides guests with a terrace. 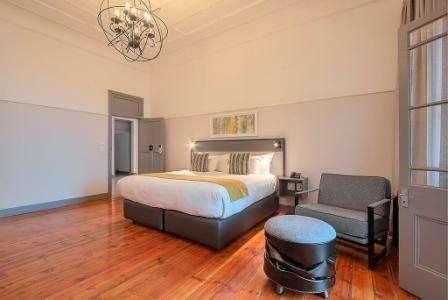 Located in Pretoria’s central business district, Burgers Park Hotel is 550 metres from the National Museum of Natural History and 3 kilometres from the Union Buildings. 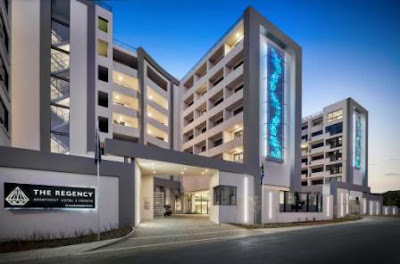 The Manhattan Hotel offers luxurious accommodation within easy access to major highways, 400 meters from Pretoria’s Gautrain Station. Free Wi-Fi is available throughout the hotel. Located in Pretoria, 4 km from Union Buildings, StayEasy Pretoria has an outdoor swimming pool, a garden and rooms with free WiFi access. Featuring an outdoor swimming pool, La Vida Luka - Luxury Guesthouse provides accommodation in Pretoria. Complimentary WiFi is available. 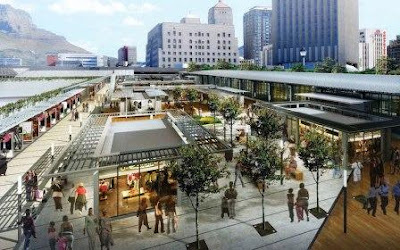 Johannesburg Park Station located in the City Centre is the main transport hub. The station built in 1930 and it passes through several maintenance up to date, today it is a mostly modern edifice and few remnants of its early architecture remain. Minibus taxis, local rail and the Gautrain ferry commuters through here every day, while long distance bus and train companies also operate from the station. 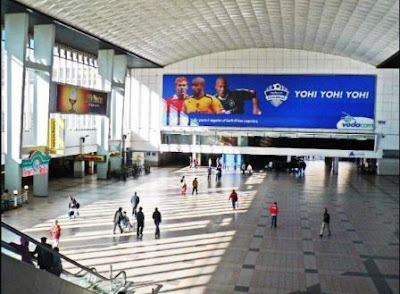 Data from the believed source show that one million people use the station every weekday which make the place to be the busiest transport hub in southern Africa. Park Station is also the starting point for the City Sightseeing bus Red City tour. 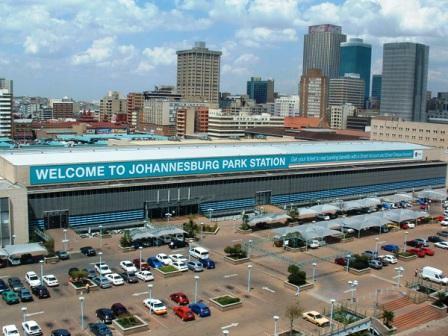 Park Station is the central railway and bus station in Johannesburg and is the largest railway station in Africa. The southern terminus of the Gautrain rapid rail service is located underground, adjacent to the existing mainline station. The location of Park Station,Johannesburg can be found on the map which provided at the end of this post. Metrorail train services from the East Rand, Soweto and Roodepoort, Shosholoza Meyl long distance railway services, Municipal and Putco bus services, Gautrain services. Also The new Bus Rapid Transit transport services available at the station. Johannesburg Park Station is also the place of the southern terminus of the Gautrain, A high speed rail link to Pretoria and the OR Tambo airport. The Gautrain station is adjacent to the existing main-line station, beneath Smit and Wolmarans streets, but with separate access. The station is modern and secure, with tight security and visible policing. Services run at 10 minute intervals during peak time, and access to services is via a pre-paid contactless Gautrain card. The station is underground, being connected via 9 miles of tunnel to Marlboro station. The line is fully electrified and built to the international standard 1,435 mm (4 ft 8 1⁄2 in) gauge, broader than the 'standard' 1,067 mm (3 ft 6 in) Cape gauge. For the easiest way to get Tax services in Johannesburg Park Station, You can use online services from Johannesburg Park Station taxi Cabs. Their main services are , corporate transfers, Johannesburg Airport Shuttles, Sandton to Johannesburg Airport, wedding transport, Bachelor party bus hire,school transfers and Kruger National Park Shuttles. Durban Bus Station Is one stop center for all Intercity buses which cme and go from the station. It is one among the best and smart terminal in South Africa, If you are looking to get into this station, You may use the following address of Durban Station is 222 Umgeni Rd Stamford Hill, Durban, 4025 South Africa. There is Road networks which link Durban to all the major cities in South Africa, making road travel an easily accessible way of getting to Durban. The N2 from Cape Town provides a scenic coastal route (the drive is approximately 18 hours) and the N3 from Johannesburg skirts the majestic Drakensburg Mountains (the drive is approximately 6 hours). Durban has a very efficient city bus service and some of them have facilities for Disabled Person like wheelchair spaces, very reasonably priced and travel through the city and beachfront every 15 minutes. 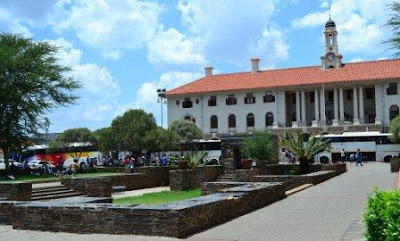 The city route includes stops at the City Hall, Durban mosque and cathedral, Tourism Information Centre, the Playhouse Theatre, the Victorian Street Market and Inkosi Albert Luthuli ICC Complex. The beachfront route starts at the Suncoast Casino and ends at uShaka Marine World. You can visit this station to get your travell bus tickets and view bus schedules for the Durban Station at the bus offices which located within the station. Some buses which serves the Durban Station include Greyhound, Intercape Mainliner, Translux, APM and many more. All intercity buses arrive and depart from New Durban Station located on NMR Avenue. Also the Bazbus is available for a fun way of getting to all destination within South Africa from Durban Bus Station. The Babus is popular with backpackers, This hop on hop off service runs along the coast between Cape Town and Durban and allows passengers to take as many days to travel as they like, choosing from a multitude of hostels to stay at along the way. 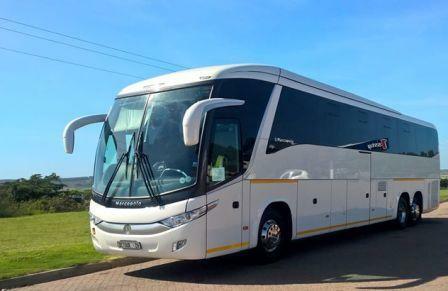 Although minibus are a highly affordable and popular mode of transport for locals and foreigner as well, it is not always advisable to make this your first transport choice for foreigner to get into Durban Bus Station. They are often unroadworthy and driven by reckless drivers but if you are looking for a truly South African experience then this is the way to travel. The most secured way to get into Duran Bus Station for Foreigner is by using Taxis/Cab though it is expensive compared to minibuses. Apart from the above means of transport, You can also use a Shuttle services to get into Durban Bus Station. A shuttle service can be booked in advance. In this case, you will be contacted by cell phone upon arrival or met by the driver with your name indicated on a placard. Rooms From (Per Person Sharing): R Good Value - Contact us. Set in a secure estate, the 45 Summer Sands apartment is well located along the prime area of the Golden Mile, three blocks away from Durban’s North Beach. Rooms From (Per Person Sharing): R Good Value - Contact us. 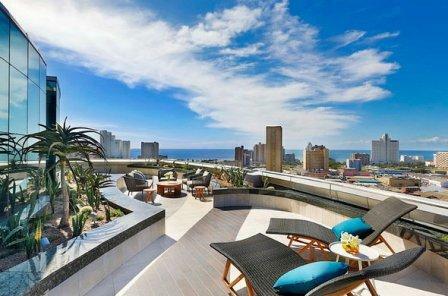 North Beach Durban Holiday Home offers a lovely seaside holiday in the North Beach area of Durban. It is ideal for a group or a small family looking for a relaxing stay. Rooms From (Per Person Sharing): R 425.00. Madeline Garden Apartment lies in the hub of Durban’s suburban street life but is tucked away in a quiet and private area, offering guests a getaway with all amenities nearby. Rooms From (Per Person Sharing): R 375.00. Coweys Corner is a Victorian-style residence, featuring high ceilings and lots of space, and ideally situated on Durban&apos;s popular Berea. The guest house has been beautifully restored into a spacious B&amp;B establishment. Rooms From (Per Person Sharing): R 375.00. Sommersby is a charming Edwardian house, lovingly converted into a bed and breakfast in 1995. Many of the original features remain; wooden floors, high ceilings and a fireplace, which helps to create a home from home atmosphere. Rooms From (Per Person Sharing): R 350.00. 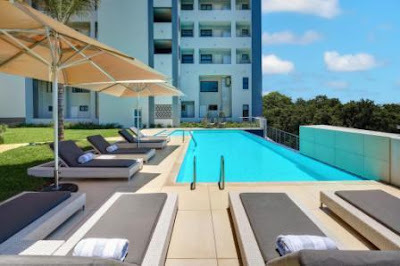 Durban View guest house is a modern, comfortable, Gay Guest House situated in the hub of Durban’s trendy restaurant and gay area with sweeping City and Sea views. Durban’s small, but growing gay community is open, friendly, and we are close to the hub of the action here. Hilton Durban has been awarded the World Travel Award for SA's Leading Business Hotel for 5 consecutive years (2013 - 2017). Hilton Durban offers 13 meeting rooms, a Ballroom for 400 people, a fully equipped Business Center, Fitness Center, Wellness Studio, Hair Salon, Curio & Clothing Shop, 328 guest rooms and a Business Lounge. 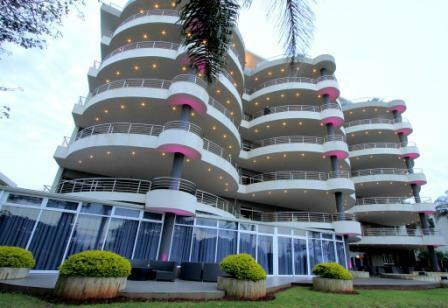 Blue Waters boasts a spectacular location just steps from the beach, on the Golden Mile Promenade. Most rooms feature a balcony with spectacular views. Each room is air-conditioned and features a mini-fridge, coffee/tea maker, flat-screen TV, work desk, and personal safe. Most rooms boast a view of the Indian Ocean, and some also overlook the World Cup Stadium. Albany Hotel is a 3-star budget hotel situated in Durba that features a restaurant and air-conditioned rooms. All rooms feature an suite bathroom with marble finish and complimentary Wi-Fi access. Other amenities include satellite television, tea and coffee facilities and a safe. Kaylin Tours decided to embark upon a programme of short to mid-length tours encapsulating a wide variety of “must see” locations and attractions available throughout the nation. These options are also available in numerous foreign languages to suit the requirements of the client. 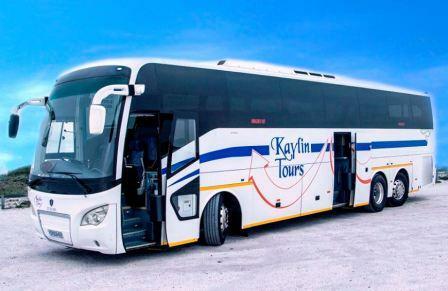 With the rapid development of South African tourism, Kaylin Tours has trained a network of highly competent drivers, some of whom are now SATOUR registered tour guides to enable visitors to make the most of each and every visit to this country. The experienced and enthusiastic office staff will also be only too happy to provide assistance and planning for all manner of customer requests. The philosophy at Kaylin Tours is to be successful through efficient, specialized and personal service to their clients. Catering for the needs of both leisure and corporate traveller, from one person through to large groups, Kaylin Tours will endeavour to accommodate every single requirement. Routing:ORTambo via Nelspruit and Hazyview with one stop. the passengers’s responsibility to identify their luggage. For those travellers and customers in South Africa who are tvavelling or send parcels across South African boarders, They should visit this station either for booking of their trip or paying for their parcels transfer. At PowerHouse Bus Station you can get and book all tickets to SADC Regions countries and other nearby countries like Zimbabwe, Zambia, Mozambique, Malawi and many more. All the booking offices for Cross Boarder buses are located here with their agents. If you need additional information about the accessibility of the bus station, try to call the below listed phone numbers or contacts. "We Will Take You There In Style"
"a true definition of luxury"
Travel with Bravo Tours for 10 times and get the 11th ride for FREE! "All the time God is the best"
"Pray Without Ceasing God is Good"
Travel 10 rides with M.V.I. you get the 11th ride for FREE! "Taking People to Places in Style..."
Physical address: Powerhouse Bus Station, 85 Simmonds Street, Corner Wolmarans, Braamfontein, Johannesburg, South Africa. The Cape Town bus terminus is a place of flux. It is the core point of workers into the city and out to the suburbs on a daily and nightly basis. Hundreds, if not thousands, of commuters travel from the township areas around Cape Town to come to work in the city. In peak hour traffic, this takes a while, resulting in people having to travel in the early hours of the morning to make it to work on time. They arrive before the full light of day, often catching the bus home again only after dark. The atmosphere in the dusk hours and again in the hours before the intense activity of the day, is empty and dark, though alive with commuters who only have this limited transit time to relax, to read their papers and to spend thinking. The long hours of a day’s work go by and again the busses are filled going home, causing a recurring cycle again and again, each and every day. This photo essay documents these hours. South Africa Is one among the African countries where most of it's people and the foreigner who are coming to the country are depending on road network to ravell to various cities, towns and villages for various purpose. This road network conveniently offering travellers to ability to reach all corners of the country. There are extensive road network in South Africa which means that bus or coach travell is a simple and often very cost effective option for travellers. Buses and Coaches become the travelling option for the more economically conscious locals and many international travellers choose coach tours or bus travel as a hassle free option. It's a wonderful way of relaxing and taking in the astounding scenery between destinations. 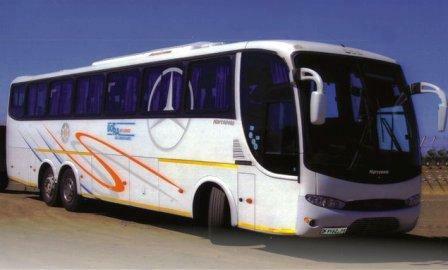 In South Africa there are a number of bus and coach operators, offering a great range of products for every price point. Some of these trips even include being served coffee, juice, snacks and biscuits with a selection of movies to entertain you while en route to your destination. There are daily Public transport for the communities and every people to travell to various destination within South Africa and Cross boarder services. There are also bus companies for hiring to serve you in your private trips like Tourism, Wedding, Sports, Special Events and many more. If you are planning to enjoy your holiday across South Africa wanting to explore the cities, towns and even villages, There are also bus companies which offer this services with a fair prices. Swanns Bus Services is established to serve the community to the very best of their ability by regularly upgrading and servicing their vehicles. All their drivers are experienced and well trained. 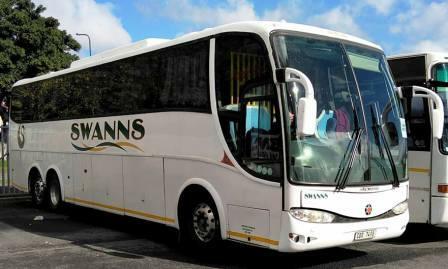 Although Swann's has been in business for more than 15 years, They are by far the most well known and trusted bus company in the Langeberg Municipality area. The business was started by the brothers André and Juan Swanepoel. They recognized the urgent need for reliable public transport in this area. Swann's started with one sixty and two twenty five seaters and grew to a company with more than fourty vehicles. Their fleet of more than 40 buses range from 14 seaters to 80 seater’s. All busses are maintained on a maintenance schedule to ensure your safety. Each bus undergo a pre trip inspection before leaving for a trip. Clubs, Sport teams, Church groups and other different institutions. They operate locally in the Langeberg Municipality area (Montagu, Ashton, Bonnievale, Robertson and McGregor) but also do long distance trips and tours. They know how to treat their passengers in a very personal and professional way. The success of their business is based on the reliability and service levels obtained by their vehicles and drivers. 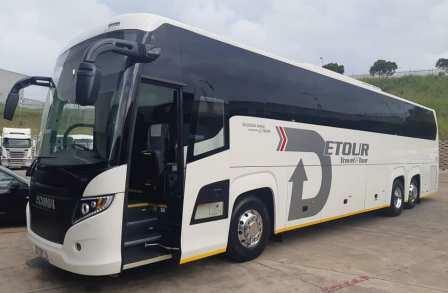 Detour Travel and Tour Bus Company began their operations in 2008 and provides a wide range of professional transport and chauffeur services to business travellers, holiday makers and schools. They are based in Durban, KwaZulu-Natal, in the Republic of South Africa and are accredited members of Durban Tourism, Tourism KwaZulu-Natal, and the Durban Chamber of Commerce and Industry. For your peace of mind and personal safety, their fleet are kept in excellent condition with regular service intervals by their vehicle agents. They maintain full vehicle and passenger insurance cover in accordance with the requirements of SATSA. They also perform regular roadworthy inspections on all their vehicles before they are permitted to leave their premises on their journey. Each of their vehicles has a valid permit issued by the South African Department of Transport, as required by law. Their wide range of vehicles from executive cars to tour buses allows them to cater for the individual traveller as well as larger groups. An airport shuttle service that can transport any size group of people to / from Durban’s King Shaka International Airport. They provide a meet and greet service with name boards at the arrival gates, getting your journey off to a convenient start. Designed for the discerning traveler, whether business or personal. Their executive cars provide that extra comfort between meetings or that shopping spree, allowing you to get on with more important things whilst being driven from point A to point B. From conferences to team building, They provide transport for large groups as well as staff travelling alone. Their professional drivers will ensure itinerary times are followed, making sure your travel plans don’t get in the way of business. They cater for all school trips including sport and bonding tours and day excursions. Their reliable vehicles and professional drivers will give you peace of mind that your learners are in safe hands. They provide transport for tourists with their own itinerary as well as those who aren’t sure where they’d like to travel. They offer tours throughout Kwazulu Natal and South Africa and will tailor the itinerary to your budget. Ez Shuttle Services currently provide an airport shuttle service in Johannesburg, Pretoria, Durban, Cape Town, Port Elizabeth, Nelspruit/Mbombela, Bloemfontein and George which provide you with continuity when travelling within South Africa. They are the only airport shuttle provider with a full online booking facility, providing you with real time confirmations as well as SMS confirmation of your order. 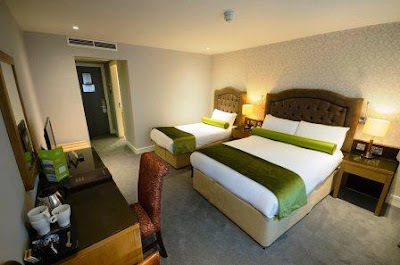 This is all done through the use of a state of the art scheduling system which was developed, and is continually improved upon, ensuring that your booking experience is seamless and hassle free. Their car rental/hire service operates out of 40 branches nationally and they can provide vehicles to match your specific requirements. They now also offer Gautrain Station transfers, which really help considering that their buses only travel on very specific and limited routes. Also, bearing in mind that your flight might be leaving very early, try give them a call to come and pick you up from your home to the station – door to door! 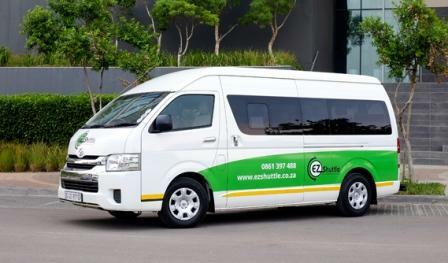 EZ Shuttle fleet are selected based on durability, reliability and style. Conveniences such as leather interior and climate control are standard within the EZ Shuttle fleet, while no vehicle exceeds a 12-month maximum service term. All vehicles are meticulously maintained, with daily inspections, and monthly servicing being the norm. Their drivers take great pride and responsibility for the vehicles under their guard and ensure that each transfer is undertaken in a clean and tidy vehicle. In addition to vehicle performance, care and comfort, passenger safety is prioritised, and as such each EZ Shuttle vehicle is covered for R10 million passenger liability insurance per incident. Their fleet is fitted with state-of the art tracking software, allowing our 24 hour manned call centre to track their every move. EZ Shuttle has extensive experience in providing coaches to groups ranging from 7 individuals to more than 3000 delegates on a single day. Whatever your large groups need, they can provide it and they do so across the country both with their own coaches as well as our extensive network of contracted partners. 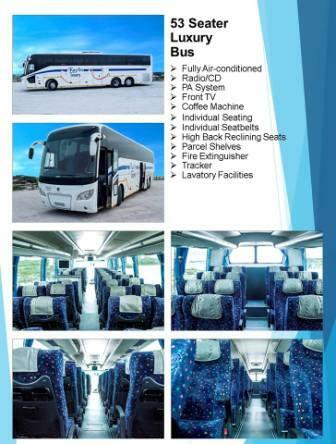 They currently provide various coaching options including Semi Lux 13, 22 and 60 seater coaches. 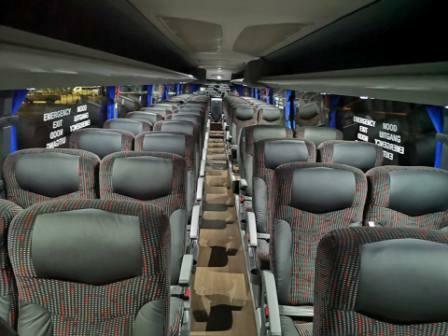 They also have 37 seater full lux coaches available on their fleet across the country. They specialize in airport transfers & shuttles for individuals and groups of up to 60 at a time. 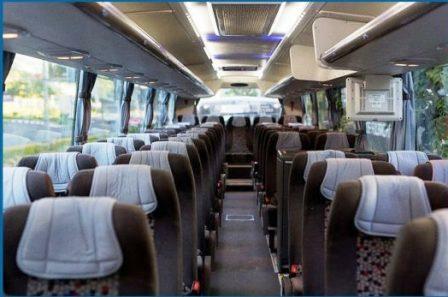 They also provide conference and bespoke transport solutions for individuals and groups as big as 3000. EZ Shuttle has extensive experience in providing coaches to groups ranging from 7 individuals to more than 3000 delegates on a single day. Whatever your large groups need, they can provide it and they do so across the country both with their own coaches as well as our extensive network of contracted partners. Their coaches can be booked for sporting events, conferences and corporate events for groups of up to 3000 delegates. Meet and greet services are also available across South Africa at all major destinations including airports. They also regularly provide coaching solutions for touring purposes across South Africa as well as across their borders into their neighboring countries such as Lesotho, Namibia, Botswana, Zimbabwe and Mozambique. They are now one of the largest passenger transport companies in the industry serving the communities and special group of people who are willing to use their services. They have a well trained personnel who are working hard to bring about good and comfortable services to their customers. Financially stable and healthy which enables them to take on large projects without any difficulty. Their buses use latest technology and they are clean and smart all the time. They have Luxury buses with 2 by 2 seating arrangement and Semi Luxury Buses with 2 by 3 seating arrangement. On board entertainments are available on their buses and Passengers can enjoy Television services and Music from their modern devices fitted on their buses. Passengers can enjoy Free WiFi services when they on board for their trip, and USB charging systems are available in every seat on the bus. Don't forget their buses have an A/C services. All their buses are available for special hire for wherever you may need to go. They cater for a variety of sizes of groups from all walks of life, going to all different kinds of events. Whether it is a corporate function, Professional or School Sporting Event, Tour, Airport Transfer or Social Function, They will take you to your destination comfortably and return you safely. They are passionate about making unforgettable dream holidays in Africa come true. Their wide selection of enthralling guided holidays, tours and safaris showcases the many, diverse splendours of Southern Africa. Each authentic, completely hassle-free guided holiday experience takes in top destination highlights; and offers their guests safe luxury transport, excellent accommodation and fine dining, fully supported by professional, caring service.